Caravaggio is a notorious figure in the history of western art. He is known for his dramatic painting style that uses extreme contrasts of light and dark, or chiaroscuro, to add depth and interest to his compositions. The artist himself led a life of drama. Fleeing Rome following an accusation of murder, Caravaggio sought refuge with the Order of St John on Malta. While a member of the Order, Caravaggio painted two notable altarpieces, The Beheading of St John the Baptist and St Jerome Writing. Both works remain on display in St John’s Co-Cathedral, the building for which they were painted. The Cardsharps was painted while Caravaggio was still in Rome. It was commissioned by a wealthy patron and art collector, Cardinal Francesco del Monte. 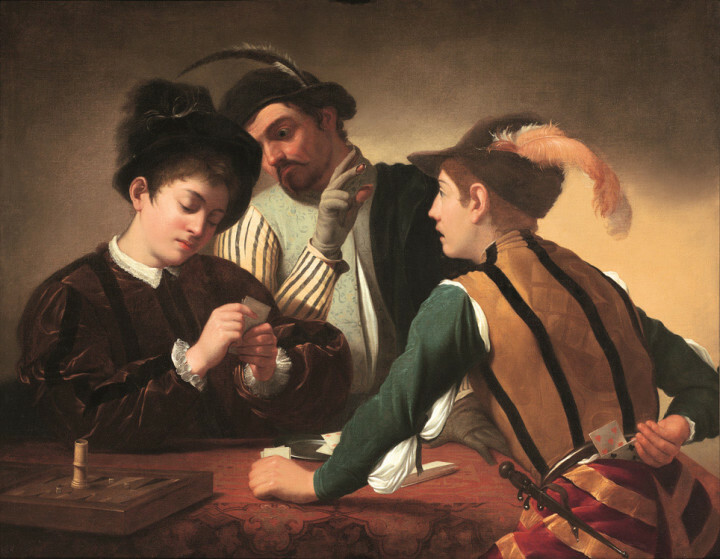 The painting shows the young dupe, on the left, being swindled by two Cardsharps, who are colluding with one another. Alluding to the story of the Prodigal Son, the moral message is communicated through the depiction of the dangers of gambling.